I’ve done various holiday tapestry projects over the years. And I’m not nearly done with this year’s holiday messing-about. In fact I’ve hardly gotten started. I have two holiday-themed four selvedge tapestries in the works and another wild idea for a decoration using four selvedge tapestry which came from Sarah Swett’s tapestry bracelets. But I wanted to share the links from last year just in case you are anything like me and wanted to join in the fun but just never found the time. In 2017 I decided to experiment with weaving with sock yarn. A whole fleet of little holiday trees emerged. There was an instruction sheet that went along with this post and you can still download it from this post. Of course the final assessment was that sock yarn makes horrible yarn for tapestry. The colors are marvelous but the squishiness of the yarn makes it really difficult to weave with. And the resulting piece has an incredibly soft hand. That is probably fine if you’re going to mount it, but otherwise it doesn’t have enough body to stand up for itself as a tapestry. I wove this little tree first and then the Christmas bulbs. Then, being frustrated with the sock yarn because knitting yarn is super bad for tapestry weaving, I went back to regular tapestry yarn from Weavers Bazaar and wove some little trees. Lots and lots of trees! Take a look at all the trees people wove last year in this blog post. They are marvelous! Maybe you’ll be inspired to weave your own. I’m just not sure I would recommend using sock yarn. (With thanks to everyone who went along with my crazy idea last year to try to find a yarn in a knitting store that would work for tapestry. There are some such stores out there but mostly they also carry weaving yarn. Look for these common ones: Lamb’s Pride worsted, Harrisville Highland or Shetland, Crown Colony, Paternayan, Appleton crewel (the last two you might find in embroidery stores). If you have time to order online, check out other marvelous yarns linked HERE. 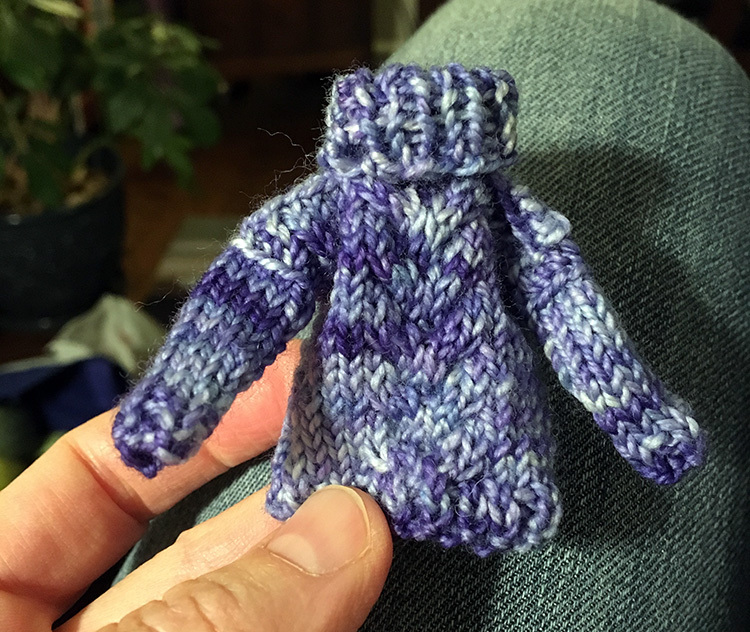 If you’re fond of knitting tiny things in December, take a look a THIS post from 2014. Apparently I not only continued knitting tiny trees, I made a bunch of fingerless mitts and some leg warmers for some people who were very tiny back then. I’m thinking a clothing shoppe for gnomes. I’m working on a new holiday video for you. Here is a preview. The weaving is done but the video editing elves haven’t stopped by while I was dreaming this week for some reason. Maybe I need to put out some free sweaters for them. I have a few other holiday tapestries in the works. Let us know what you’re weaving this year in the comments! 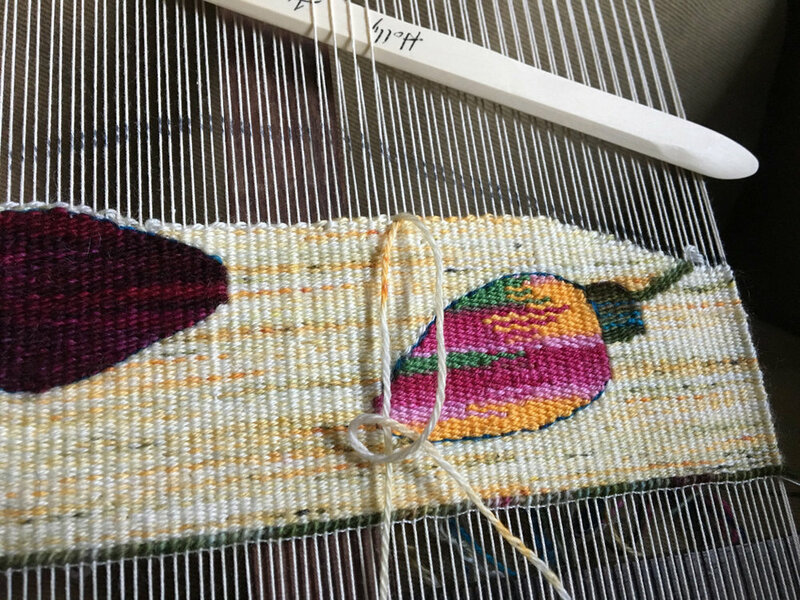 And if you weave one of the holiday trees or any other holiday tapestry, email me a photo before New Year and I’ll put it in a blog post about holiday weaving. It is inspiring to the whole community to see what everyone is making. This year Santa is bringing me a few days with my crafty book-loving parents and then some time with friends off the grid in the mountains. I’m still thanking him for last year’s drum carder. This time of year can be difficult for so many people. Love the people around you, pay attention to who needs a hug and who needs a table and friends to eat with, and take care of yourself. It is okay to sit on the couch with your loom and some yarn. Take a deep breath and remember that the light will come back soon. P.S. A string of twinkle lights go a long way toward cheering me up when it is dark by 4:30. I don’t know how people in the far north cope with all the darkness this time of year! In fact, those twinkle lights are the subject of the weaving detail above.